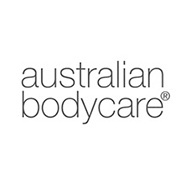 Shop Australian Bodycare for Body! From handy wet wipes to tea tree spray, find all your skincare favourites to treat skin irritations and leave skin happy and healthy. From treating cuts and grazes, to soothing spots and insect bites, to remedying athletes foot and skin irritations, Tea Tree Oil is a multi-purpose hero. It's small, but mighty and an essential for every bathroom cabinet, beauty bag and first aid kit. Treat blemishes and soothe skin irritations with the gentle, but effective range of cleansers, moisturirisers, masks and face mists. Using the natural antiseptic benefits of tea tree oil, the mild formulas of the body washes, scrubs and moisturisers keep skin feel clean, fresh and balanced. 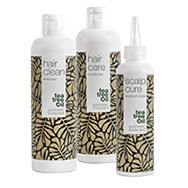 The mild and gentle haircare formulas soothe irritation and dryness for a perfectly balanced scalp and healthy-looking hair. Minimise irritation, redness and ingrown hairs with the Men's range of shaving gel and shaving balm treatment. Even the most sensitive of skins will feel comfortable, soothed and balanced. Enriched with the antiseptic benefits of Tea Tree Oil, the Intimate range soothes, protects and balances intimate areas for a fresh and comfortable feeling. 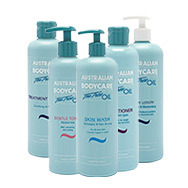 Shop all Australian Bodycare products in one place. From best-selling tea tree wipes to soothing face masks, find all you need to balance, nourish and protect your hair and skin. 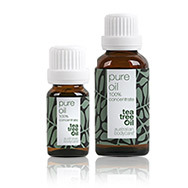 Australian Bodycare is the go to brand for tea tree oil related skincare. Australian Bodycare Tea Tree is an essential oil steam which is extracted from the Melalecua alternifolia tree which is grown in Australia. This ingredient has many different properties such as antibacterial, antiseptic, anti-fungi and anti-viral. Due to it having all these properties it is able to treat a variety of issues, such as blisters, bruises, cold sores, muscular aches, psoriasis, sore throat and toothache, and there is a product for all of those with Australian Bodycare. Not only can tee tree be used to treat almost all skincare related issues, but it can also be used in a domestic capacity, by adding a few drops to water to clean flooring, work surfaces or other bathroom and kitchen cleaning, you will always be left with home and work surfaces free from germs. We take time to protect ourselves from the sun over summer, but what about the other skin concerns that hot weather brings? Step in Australian Bodycare. The Australian Bodycare Oil is 100% pure antiseptic oil that has many uses and benefits... Read about all it's uses and benefits today! Achieve beautifully healthy skin with a 4-step bodycare regime by Australian Bodycare. Watch the video here. Contact our Customer Services team for more information! Australian Bodycare skincare choose tea tree as experience has shown that bacteria which grows on the skin uncontrolled may cause both acute and prolonged skin problems. As tea tree is an antibacterial solution it can help overcome this issue. Australian Bodycare Tea Tree Antiseptic Wet Wipes – these wipes are the perfect practical product to have on you at all times. Take them with you on family picnics, shopping, a car journey. They are suitable for all the family all the time! Leave your hands feeling fresh and germ free, all thanks to the antibacterial formulation. Australian Bodycare Body Lotion – the perfect body lotion for all over! Great for post-waxing or other hair removal treatments. Australian Bodycare Skin Wash – this hand and body wash is okay for everyday use and will leave skin feeling fresh and clean, without drying. Australian Bodycare Blemish Stick – containing the both Tea Tree and Witch-Hazel both known for fighting spots, this stick will help to reduce your blemishes and the redness that comes with it!